Click here to download a map of the rubbish collection route. Rubbish collection on Christmas Day is scheduled as a normal pickup. All bins must be placed on the verge area, adjacent to the roadway by 7.00am on the collection day, with handles facing the property line. Only items placed within the bins will be collected. All mobile bins are to remain as part of the property and must not be removed. Bins must be maintained and cleaned regularly. Residents may be held liable for any damage or loss of bins. Place your bin in a convenient location to assist with its efficient collection. Do not overload your bin or place items in the bins so that the lid will not close (70kg MAX). Place all rubbish inside the bin (rubbish not placed in the bin cannot be collected). 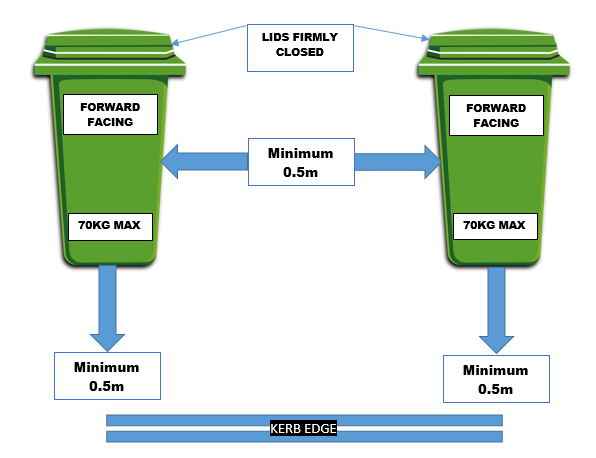 Remove the bin from the kerb as soon as convenient after it has been emptied. Place the bin on the verge for collection prior to 6AM on the day of the collection (as some collections are made early in the morning). Please do not place hot ashes or material in the bin that may cause dust nuisance or fire hazard. NEVER PUT CONTAINERS OF OIL IN YOUR WHEELIE BIN. They explode in the truck causing a mess on the truck, road, verge & your bin. Council can provide 240 litre mobile bins to each residential property within the town and to commercial premises. If you require new, replacement or additional bins or bin parts (lids, wheels or axles) you will need to complete the form below and return it to the Shire office, with payment, for processing. All residential premises are required to have one 240 litre bin. There are additional bin requirements for holiday accommodation and commercial premises. Please contact the Shire for further information or view the Holiday Accommodation Information Sheet. Commercial premises who wish to alter their collection details will also need to complete the bin request form above.